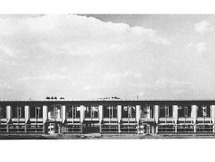 Palazzetto dello Sport in Rome is a work of Annibale Vitellozzi projected in 1956 in collaboration with Pier Luigi Nervi, which was built between 1956 and 1957 for the 1960 Olympics. The project consisted of a circular system of 60 meters in diameter. 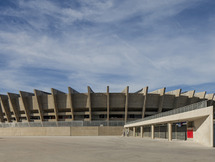 The cover is made of reinforced concrete prefabricated modules and wedge-shaped. The architect Bruno Zevi compared the Mansion of the Pantheon, suggesting analogies and parallels with the building of Hadrian: based on the same premise Zevi noted that, where the Pantheon has a spherical shape, structure Nervi and Vitellozzi comprises a hemisphere in which light enters laterally and expands the ideal space, mitigating the monumental effect.